After the taking of Montreal Governor Guy Carleton, fleeing to Quebec City, began preparing what little defence he could for the vulnerable town. All it had were its fabled, crumbling walls and its doubtful citizens. "Could the people in the town be depended upon," Carleton wrote to Lord Dartmouth. "I should flatter myself, we might hold out.... But, we have as many enemies within, and a foolish people, dupes to those traitors, with the natural fears of men unused to war, I think our fate extremely doubtful, to say nothing worse." Carleton's main hope lay in the deficiencies of Quebec's attackers and their impetuous commander, Benedict Arnold. Arnold was a short, rounded man with a placid, almost bovine face and a wild military appetite. 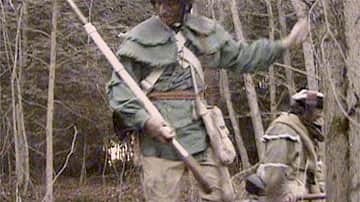 He had left Maine in September with about 1,200 volunteer militiamen, planning to take them through 180 miles of wilderness and then surprise Quebec. But the map he had was outdated and inaccurate; the distance was more than twice what he anticipated. "Our march has been attended with an amazing deal of fatigue... I have been deceived in every account of our route, which is longer and has been attended with a thousand difficulties I never apprehended," Arnold wrote. Worse, Arnold was hit by a flash flood that carried away some of his boats and destroyed food and supplies. The army was hindered by uncharted swamps, early snow and famine in the "direful, howling wilderness." They were reduced to eating their shoe leather, cartridge boxes and a pet Newfoundland dog. They slept in the open under damp blankets and pneumonia preyed on them. By the time they got to the aptly named Dead River, many had either died or deserted. Some of those who remained were too hungry to walk. "We had all along aided our weaker brethren," Private George Morison recorded in his journal, "but the dreadful moment had now arrived when these friendly offices could no longer be performed. Many of the men began to fall behind, and those in any condition to march were scarcely able to support themselves, so that it was impossible to bring them along; if we tarried with them we must all have perished." On November 8, 1775, more than a month behind schedule, Arnold arrived at Quebec with less than 700 of the twelve hundred men he had started with, and these were ragged and thin. But Arnold had lost none of his swagger. On November 15th he marched his men to within a few hundred yards of the Citadel and taunted the garrison to come out and fight. "I am ordered by his excellency General Washington to take possession of the town of Quebec," read one of the many demands for surrender. 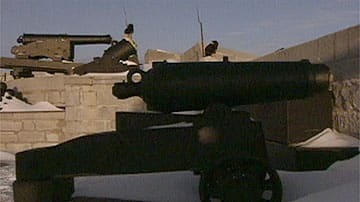 "I do therefore, in the name of the United Colonies, demand immediate surrender of the town, fortifications and city of Quebec to the forces of the United Colonies under my command." Arnold, whom Governor Guy Carleton ridiculed as "horse jockey" because of his height and his previous occupation of horse trader, had a hard time even getting his message delivered. His couriers were repeatedly turned away by musket fire and it took six days just to get the letter inside the walls. Then Arnold's ultimatum was met with extended silence. Still optimistic, he wrote to George Washington: "... we arrived here and are making all possible preparations to attack the city, which has a wretched, motley garrison of disaffected seamen, marines and inhabitants, the walls in a ruinous situation, and cannot hold out long."